Growing up I wasn’t at all an adventurous cook. Rather I took pride in mastering a few basic recipes and then cooking them over and over again. One of these recipes was a good old ‘spag bol’. When it came to my spaghetti bolognese I don’t remember following an actual recipe. In fact I’m sure I didn’t – my cookbook collection was non-existent and this was before the internet arrived. I simply started with an onion and garlic base and then added browned mince meat and pasta sauce. Of course my teenage spag bol days were a long time before my ‘no processed or packaged food’ diet – so, back then, ‘Dolmio’ pasta sauce always worked a treat. Today I wouldn’t even consider using one of the branded pasta sauces you can find in any supermarket. Because they’re typically high on added ‘nasties’ – like refined sugar. I’ll agree that in the realm of processed foods there are far greater evils than pasta sauce, but nevertheless when it’s easy to make at home with saintly ingredients there’s no excuse to take shortcuts. What’s even better is that you can make big batch at the weekend, keep half for a quick midweek meal and then freeze the rest. I’m hoping this post inspires you to give homemade pasta sauce a go. The red wine isn’t essential – it can be easily substituted with a little balsamic vinegar or some dried and soaked porcini mushrooms – both of which, like the wine, give the end sauce an extra wow factor. These quantities will make enough sauce to serve 6-8 people. Finely chop the onions and garlic and cook them in a large pot with a little oil until soft. Add the herbs, bay leaves, red wine and water. Cook until the liquid reduces by about half. Add the tomato passata, chilli flakes, salt and pepper and bring to a simmer. Cover the pot and transfer to the oven. Cook at 150C for 2-3 hours. If you’re using eggplant/aubergine chop it into small cubes and add it about an hour before the end of the cooking time. 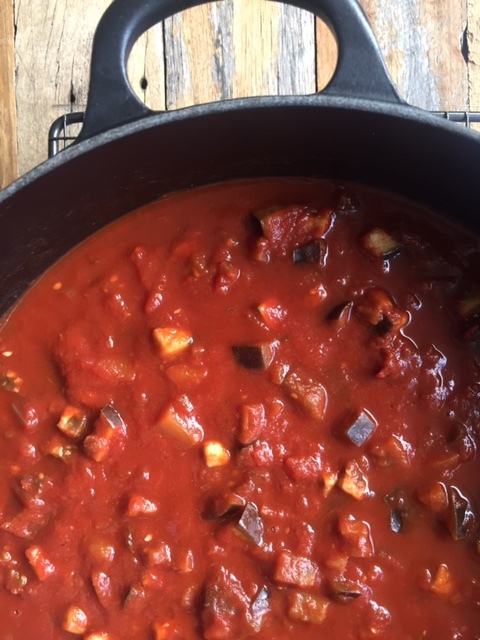 If you’re short on time you could simmer on the stove and reduce the cooking time – but I find that 2-3 hours in the oven makes for an extra rich pasta sauce. 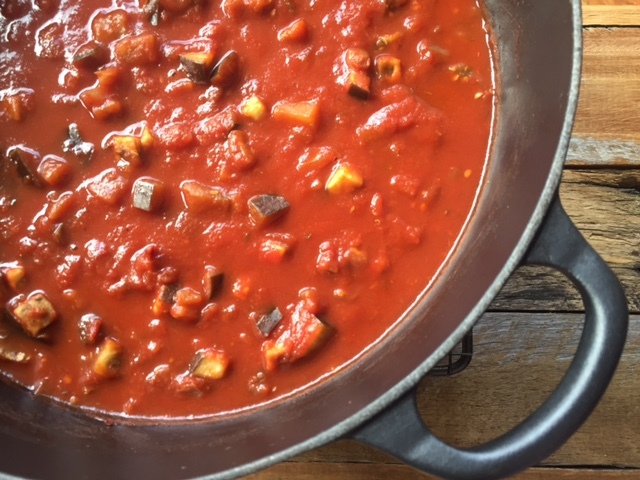 Going back to where I started this post, with my childhood memories of spag bol, I’d love to know – what were your favourite childhood recipes that you’d approach very differently today? Tags: homemade, pasta sauce, recipe, red wine. Bookmark the permalink. The sauce looks so good Laura! I like the addition of eggplant in it. 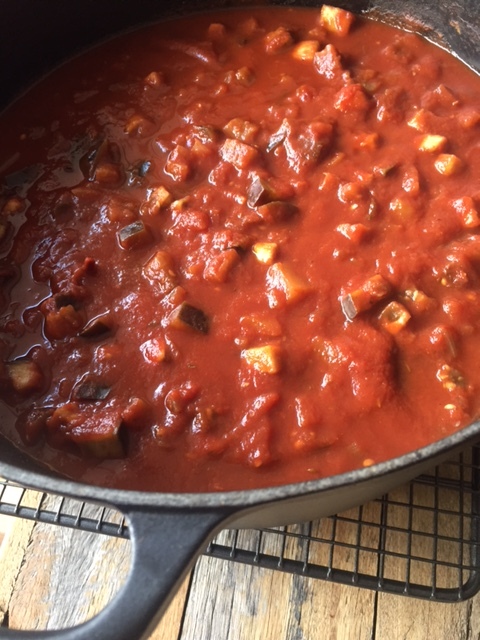 Thanks Sandhya – and yes the eggplant works really well to add a chunkier texture…. eggplant is wonderful idea! Thank you for inspiration!! Great recipe, Laura. I too put red wine in my spag bol sauce but I love your addition of aubergine, which is one of my favourite things to eat. My mother made the most delicious smoked fish pie when I was growing up. Now that winter approaches it’s on my list to give this fantastic pie a revamp. Hi Tracey, sounds like aubergine would be a good addition to your pasta sauce. And your mum’s fish pie sounds amazing – do share the recipe if you give it a go! Thanks Sumith – it’s also keep well in the fridge for over a week so it was worthwhile making a big batch! Looks lovely! I’m with you… homemade everything! My pasta sauce is filled with all sorts of vegetables but I have never thought to include aubergine… I will have to try this one! Thanks Annika – homemade everything is definitely the way to go! Hi Petra – I agree sometimes a ready made sauce is called for because of needed ease or time saving – in which case I always find it’s worth label checking to find the best one you can with the least ‘nasties’ added! Yum! I love the addition of eggplant! Oh, I can smell it from here! Nothing like a good, homemade sauce. Thanks for sharing your recipe, Laura!! Thanks so much – mushrooms would also work well in place of the eggplant and the red wine is a must – adds to the flavour! Oh my gosh, that looks good! I’ve never had a pasta with eggplant but it sounds not only delish, but a great way to sneak in an extra vegetable! Hi – yes I’m surprised by all of the comments on the eggplant in this dish Mollie, I didn’t realise it would be such a hit!